The Indian Premier League's 20/20 competition starts in South Africa. South Africa's Proteas clinch the series by beating Australia at the MCG. This is South Africa's first cricket series win in Australia, and Australia's first home series defeat since 1992 against the West Indies. South Africa's national cricket team, the Proteas, beat England at Edgbaston to ensure a test series victory in England for the first time since 1965. South Africa's rugby Springboks beat New Zealander's All Blacks for the first time at Carisbrooke Stadium in Dunedin, the "House of Pain"; where the teams first played in 1921. The score is 30-28. Double amputee, Oscar Pistorius, wins the right to participate at the able-bodied olympics when the Court of Arbitration for Sport overturns an earlier decision by the International Association of Athletics Federations to ban Pistorius. The Springboks, captained by John Smit, beat England 15-6 to win the Rugby World Cup at the Stade de France in Paris. Percy Sonn dies in Cape Town at the age of 57. Sonn, who was the first African president of the ICC and a former president of the United Cricket Board of South Africa, suffered complications after an operation on his colon on the 21st May 2007. Away from cricket, Sonn was responsible for forming and heading "the Scorpions", the Directorate of Special Operations in South Africa - a highly effective outfit responsible for fighthing serious crime. South Africa's Bulls (based in Pretoria) win the Super 14 contest, the first time ever that a South African team wins the event. They beat the Sharks in Durban, in an all-South Africa final (also a first). In the first ever test rugby match at the Royal Bafokeng Stadium, South Africa's Springboks beat New Zealand's All Blacks 21-20. Roland Schoeman breaks the world 50m freestyle short-course record in Germany, clocking 20.98sec to improve on the previous 21.10sec mark set by France's Fred Bousquet in 2004. This was Schoeman's 8th world record since 2000. South Africa beat Australia in the highest scoring one-day international. Australia scored 434/4. Batting second, South Africa scored 438/9, winning with a ball and a wicket to spare. Former Bok coach, Rudolf Straueli, apologises for the furore that erupted around his "Kamp Staaldraad". During a league match between Kaizer Chiefs and Orlando Pirates, 43 soccer fans die at Ellis Park stadium from being crushed, as the stadium is filled beyond capacity by fans forcing their way through perimeter security and into the packed ground. SA cricket team captain Hansie Cronje is sacked after admitting that he and other players engaged in match-fixing, sparking the country's worst-ever sports scandal. The government appoints a commission headed by retired judge Edwin King. On the 11th October 2000, Cronje was banned for life from cricket; he died in a 2002 plane crash. King concluded his investigation unsure if Cronje had been entirely forthcoming. Cathy O' Dowd becomes the first woman to summit Mount Everest from both the northern and southern side. George Mallory’s grandson, George Mallory II, reaches the summit of Mount Everest, 71 years after the disappearance of his grandfather. Mallory and his climbing partner, Jeff Hall, cut a hole in the snow and buried a picture of Mallory's grandfather at the summit of Mount Everest. Wally Hayward, at the age of 80, completes the 87.5km Comrades Marathon in 10 hours and 58 seconds. Gerrie Coetzee becomes the first South African and African world heavyweight boxing champion. Sydney Maree becomes the first black athlete to win the SA Athlete of the Year Award, in the same year as he wins the New York Mile. Errol Tobias is the first black player to play for South Africa, in a test against Ireland at Newlands. September 1979; Jody Scheckter, from East London, becomes the first (and to date, only) South African to be crowned world Formula One racing champion. It would be 21 years before Ferrari was to claim another drivers' championship. In Kerry Packer's world tournament, Garth le Roux is judged to be Man of the Series. A multiracial NSPL soccer league is established with 24 teams of mixed race. A multiracial Springbok soccer team play Rhodesia at the Rand Stadium, in front of 40 000. Defying the government and rugby authorities, the Junior Springbok Cheeky Watson and 7 other whites play in a mixed-race rugby match. The Jockey Club ruled that, due to a Government instruction, non-whites cannot own registered racehorses. Japan stops issuing entry visas to South African nationals wishing to engage in educations, cultural or sporting activities with Japan. Aurora becomes the first multi-racial club in South Africa to play white league cricket. In the first mixed-race boxing match in apartheid South Africa, Bob Foster beats Pierre Fourie. Shaun Bartlett (footballer) is born. The Keg Leage (the name was later changed to the Castle League) is founded with 13 teams (including Bloemfontein Celtics, Kaizer Chiefs, Moroka Swallows, Orlando Pirates and Witbank Black Aces). Roger Bourgareland, a black with African genes (but born in France), tours SA as part of the French rugby team playing on the wing. An American tennis player, Arthur Ashe, is refused a visa to visit South Africa. The first Maoris and Samoans tour SA with the 1970 New Zealand All Blacks. Sis Going (Maori) and Bryan Williams (Samoan) make a huge impression on white South Africans. Anti-apartheid demonstrators, led by Peter Hain, disrupt the Springbok's tour of Britain. Playing for Worcestershire, the coloured cricketer Basil D'Oliviera is refused entry to South Africa. 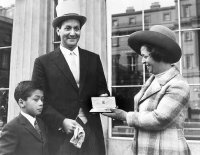 Basil D'Oliviera wins his first cap for England playing against the West Indies. Karen Muir, then 12 years old, breaks the world record in the 110-yards backstroke; becoming the youngest world-record holder in any sport. Karen was a Std V student at Diamantveld Laërskool, Kimberley. Her comment "It has been a bit too much and I still cannot really believe that I am the holder of the world record. It's like some thing out of a fairy tale. Everyone has been very kind and wonderful but I am glad that the fuss is finished". South Africa is banned from the Olympic Games because of its racist policies. The Australians beat the Springboks in a test rugby match in Johannesburg. Basil D'Oliviera leaves South Africa for England, to pursue a career in a country without a colour bar. The last appearance (until 1992) of South Africa at the olympics. Geof Griffin, then 21, becomes the first South African to take a hat trick in test cricket. Griffin is no-balled 8 times for throwing practically ending his test career. Gary Player wins the British Open for the first time. On February the 24th 1957 Hugh Tayfield takes 9/113 in a single innings against England at the Wanderers. On the 5th January 1957 Russell Endean became the first cricketer to be given out "handled ball" in a test against England. The longest cricket match was between South Africa and England in Durban, South Africa and began on March 03, 1939 and continued till March 14, 1939, although they did not play on the 5th, 11th or 12th. Unfortunately England had to catch a boat home on the 15th so after play on the 14th the match was called a draw and both teams went home. The world's longest cricket match spanned 43 hours and 16 minutes of playing time in which 1,981 runs were scored. Krom Hendricks, a Cape Malay, is excluded from the first South African cricket team to tour England. Hendricks, a fast bowler, had been singled out by the visiting English captain of 1892 as central to any South African side that might be selected to tour England. Hendricks' fate was sealed when the head of South African cricket, Sir William Milton, vetoed Hendricks’s selection (after consulting the Cape Prime Minister, Cecil John Rhodes). The first cricket test match is played at Newlands, Cape Colony v England. A group of cyclists ride their penny farthings from Port Elizabeth to Cape Town. Zonnebloem College fielded 2 teams of young black cricketers in their first away games against Ronde-bosch (and against Wynberg in 1865).